Walking is still considered one of the best forms of exercise. Almost anyone can do it. It is low-impact so people suffering from injuries, or older individuals with more sensitive joints can get the benefits of a good aerobic workout without adding to existing problems. The drawback is you have to go outside to seriously walk unless you have a treadmill at home. The Horizon Fitness T101 Treadmill has everything you need for a great workout in the comfort of your own home. Going out and walking is not a bad thing, but if it is raining, snowing, or the pavement is icy it can be dangerous. Add hazardous roadways, or reckless drivers and walking in the great outdoors can be a less than positive experience. You can join a gym, but that's expensive, and you have to get there. You must adhere to gym hours, so if you want to work out before bed, or early in the morning, you may be out of luck. Certainly a treadmill will cost you a few dollars, but the cost of a gym membership over a year, or two will be much more significant. The fact is, most treadmills are basically the same. A conveyor belt on a platform with handlebars or arm braces and a center console . Some are manually driven while others have a motor and are self-propelled. 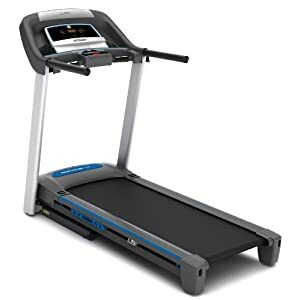 Manually driven treadmills are the cheapest version you can find, but they are much more flimsy, and you can't program them to different speeds or workout patterns the way you can with a motorized version. The Horizon Fitness T101 Treadmill is a motor driven treadmill that is designed to give you the workout you need. Monitored statistics such as distance, speed, time, heart rate and even calories burned. The more the treadmill can record, the better you can judge the success of your workout program, and plan future sessions for the best results. The T101 has several extra features that make every workout more fun, and pleasant. It has a built-in stereo system that will play your MP3s as you workout. The Sonic Surround speakers deliver high-quality sound for your listening pleasure. Music makes your workout times go faster, and keep you motivated as you walk. The Horizon Fitness T101 also has a built-in center fan to keep you cool while you walk. When you first start walking, it is important to watch your heart rate as a measure of the stress on your body. You need to go slow until your body becomes accustomed to the increased activity. The Horizon Fitness T101 Treadmill has a pulse monitor on the hand grip to keep track of your heart rate as you exercise. The best way to get a more advanced workout from your walking sessions is using interval training methods. You can use the Horizon Fitness T101 pulse grips to monitor your heart rate as you work out and reach a stress point, and then slow down until your heart rate returns to normal, and repeat the pattern. 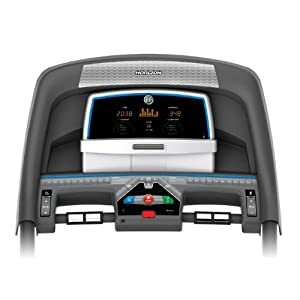 Using the incline settings on the Horizon Fitness T101 Treadmill increases the intensity of your workouts. You can use multiple settings during each session to increase and decrease tension within your intervals, or use a lower setting as you start out and get used to walking. The various speed settings help you regulate your intervals as well, and the many pre-programmed settings can help you develop your routine until you are experienced enough to plan your own. Johnson Health Tech has been in the business of fitness for years, and is the largest manufacturer of treadmills and other fitness machines worldwide. You get the quality of a great company reputation, a strong, durable machine with a lifetime warranty on the frame and motorized parts. All other parts have a 1- year warranty along with labor for repairs. The Horizon Fitness T101 Treadmill is big enough to handle the stress of a hard workout. It is big and broad so that it won't wobble as you walk. It also has a 300 pound weight capacity for individuals who are looking for a weight loss exercise they can do at home. For a great workout, the Horizon Fitness T101 Treadmill is an excellent resource that isn't too expensive, but is made well enough to hold up to a serious exercise session. It has advanced computer technology incorporated into the LCD monitor for easy programming and tracking of your progress. It is good for users with any level of experience. The Horizon Fitness T101 Treadmills qualifies for the free super saving delivery at Amazon.